Who? 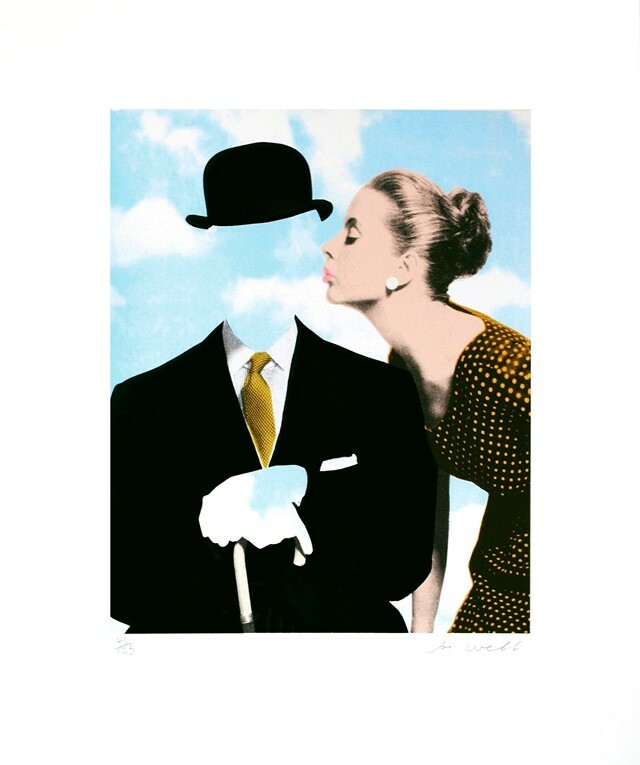 Joe Webb is a former graphic artist who, tired of modern technology and its mind-boggling potentials, turned to collage, a technique he described as "more immediate and graphic than painting". An avid collector of vintage magazines and printed ephemera, Webb uses cut-outs of original material stumbled upon in charity shops and second hand bookstores to create surreal, hand-made juxtapositions. Combining only two elements in each piece with the intention of "reinventing the original scene trying to find a narrative through the process", Webb’s work recalls that of Metaphysical and Surrealist artists like De Chirico and Magritte – these influences echoed in both the simplicity of the compositions and the choice of subjects. Made in his studio in East Sussex, Webb’s collages have gone viral online, with hundreds of thousands of people across the world sharing his work. What? Last week saw the opening of Webb's new exhibition, Paper Cuts, at the Saatchi Gallery. An examination of love and life in the 21st century, the show explores human relationships and man’s interaction with the surrounding environment through cross-media printing techniques. The works on display are thought-provoking and metaphorical, with a high concentration of 1950s-inspired prints. 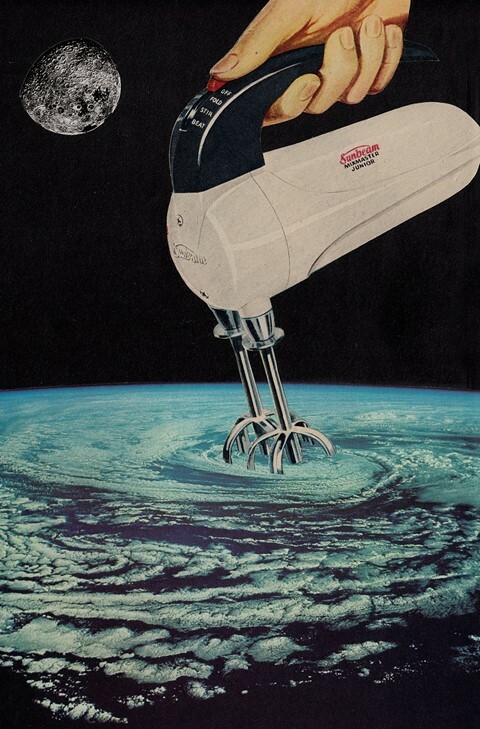 Stirring Up A Storm, for instance – which sees an electric whisk stirring Earth’s atmosphere – can be read as an invocation to think about global warming and energy crisis issues. 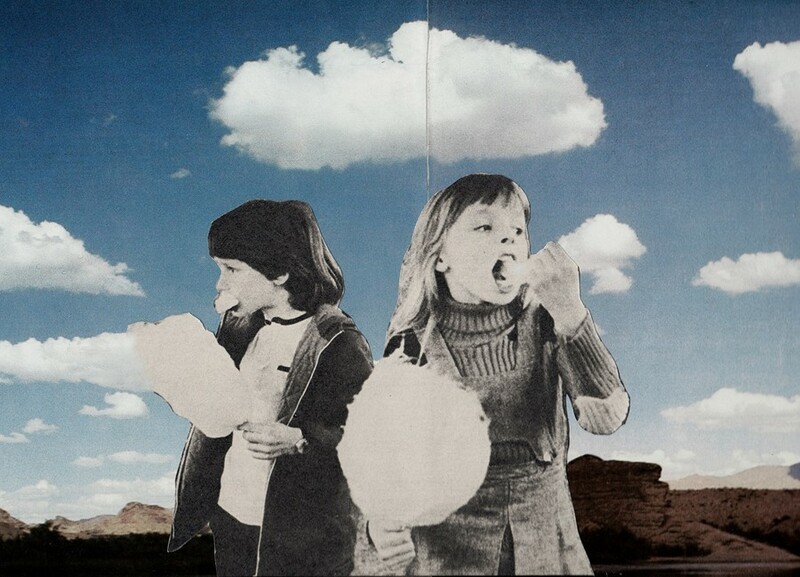 Political engagement alternates with lighter humour in works like The Cloud Eaters, a collage of two kids eating cloud-like candyfloss against a gloomy background, and Life's a Beach, a cut-out of a happy couple on the beach with a tank in action behind them. Henri Matisse described his work as "painting with scissors", a description that can also be applied to Webb. Why? Paper Cuts is an extensive collection of works – a number of original collages, paintings and limited edition prints. Many of the pieces on show are being exhibited for the first time, with a selected number of prints available for sale. "I started making these simple hand-made collages as a sort of Luddite reaction to working as a graphic artist on computers for many years," Webb says. "I like the limitations of collage, just using found imagery and a pair of scissors." The inspiration behind the show was "to find those moments of serendipity which transform normal found images into artworks." However, "using a very sharp scalpel to work with, I’ve managed to slice my fingertips clean off a few times… so the title Paper Cuts has an extra meaning to me!" Paper Cuts is at the Saatchi Gallery until April 7.